Sesame St S5: Bert and Ernie, Etc. And now we finally come to our last day of clips from Season 5, nearly all of this batch revolving around Sesame Street‘s own dynamic duo, Bert and Ernie. And today, we have even more highlights from Sesame Street‘s fifth season! 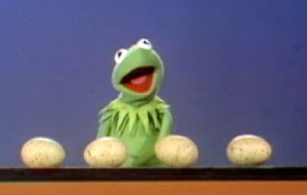 The first one I watched for today’s post is another brief lecture from Kermit, this time about counting 4 eggs. As his demonstration goes on, however, each egg begins to hatch and a baby Muppet chick pops out, which subtly introduces the concept of subtraction. Then, he has 4 chicks to count, after which each wanders off one at a time, reiterating the lesson. 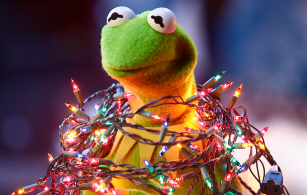 It’s also particularly fun because the series of flustered expressions Kermit’s face goes through by the end reach practically epic heights. And you can watch all of them, along with the rest of the sketch of course, here! 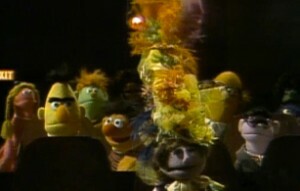 The “tall hat lady” blocks Ernie at the movies. Today, we proceed with our first day of highlights from Season 5 of Sesame Street. As per usual, I watched the first set on the Sesame Street: Old School Volume 1 DVD set.